Arniston Rangers recovered to gain a point against Hawick Royal Albert but they still missed out on qualification to the League Cup after finishing bottom of section A. A makeshift Royalists team came flying out of the traps to open the scoring in the eighth minute. Hawick United’s Declan Hogg, one of several trialists on view, shot home after a thundering Mark McGovern free kick had cannoned off the bar. It was hardly the start Arniston wanted but it was to prove to be something of a false dawn for Hawick. Apart from Rangers keeper Darren McBay pulling off a fine save from McGovern, the visitors had the upper hand for the remainder of the first half. Rangers however were repeatedly kept at bay by some superb saves by Albert number one Craig Saunders which came right out of the top drawer. Saunders, however, was beaten in the 24th minute when Paul Power found the corner of the net with a perfectly taken penalty. With three minutes of the second period gone the Albert went ahead for a second time. Latching on to a Dawid Lyko pass, Josh Neil broke forward to dance round McBay and take the ball into an empty net. Towards the hour mark, Arniston were reduced to ten men due to the red carding of Glen Marshall for apparent dissent. The Albert however failed to take advantage of playing against a side who were a man adrift. Indeed if anything Royalists dropped down a gear. 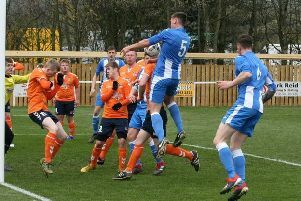 Arniston were in the driving seat and had a golden opportunity to grab an equaliser on being awarded a penalty following the upending of Rory Mair by Colin Turnbull. There was to be no goal joy for the Gorebridge men though as Power’s spot kick was brilliantly saved by Saunders. In the 74th minute Arniston did produce the scoring touch when Finlay Toulouse equalised in tucking away a Mair cut back. Almost on time Albert’s Samuel Odetayo was given his marching orders for a challenge on Mair.